The Name of the Wind, also called The Kingkiller Chronicle: Day One, is a heroic fantasy novel written by American author Patrick Rothfuss. It is the first book in the ongoing fantasy trilogy The Kingkiller Chronicle, followed by The Wise Man's Fear. It was published on March 27, 2007 by DAW Books. Rothfuss wrote The Name of the Wind during his nine-year advance toward his B.S. in English. He drew inspiration from the idea that he wanted a completely new kind of book that doesn't have the generic characteristics of fantasy. Before its release, an excerpt from the novel was released as a short story titled The Road to Levinshir, which won the Writers of the Future contest in 2002. A sequel entitled The Wise Man's Fear was released on March 1, 2011 by DAW Books. The book is divided into two timelines: the first in the present, told through a third-person narrator; the second in protagonist Kvothe's past, narrated by Kvothe himself. The book also contains a "prologue" and an "epilogue", which are almost word-for-word identical texts, but they have subtle changes that can cause different thoughts. The Kingkiller Chronicle takes place in the fictional world of Temerant, a large continent of which the known part, called the Four Corners of Civilization, is divided into several distinct nations and cultures. Much of the world follows a religion similar, though not identical, to medieval Christianity. Coexisting alongside the mortal world is the realm of The Fae, a parallel universe inhabited by supernatural creatures which can move between the two realms only when the moon is full. Magic exists in Temerant, too, but obeys a well-defined set of rules and principles that can only be exploited by those who have trained in its professional and scientific use. As the novel begins, the reader hears an old storyteller speaking of a famous old wizard called Taborlin the Great, who was captured by evil beings called the Chandrian. Escaping them, Taborlin fell from a great height—but since he knew the "Name of the Wind", he called it and the Wind came and set him down safely. In later parts of the book, characters are often skeptical of such stories. Some kinds of magic are taught in the University as academic disciplines and have daily-life applications (those who can afford it are able to buy magical lamps, for example, much better than the candles used by poorer people). However, most of the population does not have reliable knowledge of the magical disciplines and many still doubt that magicians can truly call upon the Wind. The Chandrian—whose appearance is supposedly heralded by flames turning blue—are often dismissed as mythical bogeymen. In the rural town of Newarre, the Waystone Inn is managed by an innkeeper named Kote and his assistant Bast. It is revealed that Kote is actually the renowned Kvothe: an unequaled sword fighter, magician, and musician, rumored to have killed a king and caused the present war in which the civilized world is embroiled. Bast is Kvothe's assistant and student and a prince of the Fae. Kvothe has gone into hiding and assumed the identity of Kote in order to keep a low profile. Kvothe saves a traveling scribe known as Chronicler from spider-like creatures called scrael, whereupon Chronicler, recognizing Kvothe, asks to record his story. Upon consenting, Kvothe tells Chronicler that this will take three days (corresponding to the planned trilogy of novels). Kvothe begins his story during his childhood, when he lived amongst a troupe of highly reputed traveling performers known as Edema Ruh. His loving parents train him from a young age as an actor, singer and lute player. He does extremely well in all of these as in every other field to which he turns his hand. The troupe acquires the scholar and arcanist Abenthy, who trains Kvothe in science and sympathy: a discipline that creates links from one physical object to allow manipulation of another. 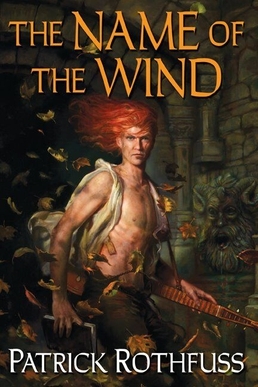 Kvothe also witnesses Abenthy calling the wind to fend off suspicious townspeople and vows to discover the titular "Name of the Wind", permitting this control. Kvothe's father, the famous bard Arliden, starts composing what was to be the greatest of his works—a ballad of the ancient tragic hero Lanre. For this composition, Arliden starts collecting all the various tales of the mythical Chandrian and tries to get at the kernel of truth behind them—without explaining how this is related to Lanre. This inquiry turns out to have fatal consequences. When the troupe makes camp, Kvothe's mother sends him to gather sage in the surrounding woods. Upon returning, he finds his parents and all members of his troupe dead, and the all-too-real Chandrian seated around the campfire, which has turned blue. Evidently, they disliked Arliden's researches and came to silence him and everybody else with whom he might have shared his findings. The twelve-year-old Kvothe is on the point of being killed by the Chandrian named Cinder when their leader, Lord Haliax, pressures them to depart due to the approach of some mysterious enemies of theirs. The heavily traumatized Kvothe, alive but all alone, spends three years in the slums of the city of Tarbean as a beggar and pickpocket. He is nudged out of this life by hearing a storyteller recount a story of how the hero Lanre became a renegade after the death of his beloved wife, went over to the evil forces he had fought and destroyed the cities with whose protection he was charged—and then changed his name and became himself the fearsome Lord Haliax of the Chandrian. Before Kvothe can ask more, the storyteller is arrested by the dominant Church on charges of heresy. Kvothe then resolves to get into the University, whose vast Archives include all kinds of accumulated knowledge, including, presumably, also on the Chandrian. Having with great effort obtained some minimal funds for clothing and travelling, he sets out. En route Kvothe becomes enamored with a talented young woman known as Denna, who is a musician like himself. Kvothe enters the University despite his lack of tuition funds and performs admirably as a student, but faces continuous poverty and rivalries with the wealthy student Ambrose Jakis and the arrogant Master Hemme, who sees that Kvothe receives lashing for misbehaviour. A trick by Ambrose causes Kvothe to be banished from the Archives, hampering his research on the Chandrian, though he does very well in other fields of study, advancing extremely fast in academic degrees and gaining some loyal friends. Kvothe buys a lute despite his poverty, and performs brilliantly at a famous musical tavern to earn money, where he also befriends Denna again. Hearing reports of blue fire and murder at a rural wedding, he suspects the Chandrian and visits the site. There, Kvothe and Denna meet a local farmer who reported the blue fire, and later, as they are searching for the Chandrian, they encounter a draccus, which nearly destroys the local town before it is slain by Kvothe. He does succeed in discovering the reason why the Chandrian murdered all of the wedding's participants: the bride's father had dug in the earth and discovered an old pot on which were paintings of all seven Chandrian; they came to recover the pot and kill anyone who may have seen it. Back at the University, Ambrose taunts Kvothe and breaks his lute. In a fit of rage, Kvothe unintentionally calls the Name of the Wind, breaking Ambrose's arm in the process. As a result of the confrontation, Kvothe is sentenced to further lashing but avoids expulsion. Thanks to his clear magical aptitude, he is also promoted in rank as a student under Master Namer Elodin's tutelage. In the inn at the present day, a mercenary possessed by a supposed skin dancer attacks the patrons and kills one of them. When Kvothe seemingly fails to use magic to help, the skin dancer is killed by the local blacksmith's apprentice, Aaron. The first day ends when Kvothe finishes the first chapter of his story and the town settles down for the night after the commotion. At night, Bast breaks into Chronicler's room and reveals Chronicler's coming was part of his plan all along. He threatens Chronicler to focus Kvothe on the more heroic aspects of his story in the hope that Kvothe will abandon his apathy and return to his former heroic self. In the epilogue, it is implied Bast's fears are well-founded, as the present-day Kvothe is described as just a man "waiting to die." Finnish symphonic metal band Nightwish wrote and performed a song called "Edema Ruh" on their album Endless Forms Most Beautiful (2015), named after the traveling people in The Name of the Wind. In the reboot Mystery Science Theatre 3000: The Return, season 1 episode 8, Crow comments on a scene of travelers with wagons and carts, "Oh, it's the Edema Ruh." The electro-pop band Shaed is named after the magical cloak made of shadows in The Name of the Wind. Orion have also released UK version of the audio books of The Name of the Wind and The Wise Man's Fear narrated by Rupert Degas. Brilliance audio has released US version of the audio books of The Name of the Wind and The Wise Man's Fear narrated by Nick Podehl. Another version was released on tape narrated by Fred Major for the American Printing House for the Blind. ^ KG, Literatur-Couch Medien GmbH & Co. "Interview with Patrick Rothfuss". Phantastik-Couch.de (in German). Retrieved 2018-10-17. ^ Rothfuss, Patrick. "A Glimpse of Things to Come". Patrick Rothfuss. Retrieved 29 November 2011. ^ "The Quill Award Winners". Goodreads. Retrieved 10 August 2015. ^ Staff (November 5, 2007). "PW's Best Books of the Year". Publishers Weekly. Retrieved 10 August 2015. ^ "Alex Award Winning Books for Mature Teenagers – Another Book List". Word Press. September 1, 2008. Retrieved 4 June 2012. ^ "2008 Alex Awards". Ala.org. YALSA. Retrieved 10 August 2015. ^ Webmaster, Rodger Turner,. "The SF Site: Readers' Choice Best Read of the Year in Science Fiction and Fantasy". www.sfsite.com. Retrieved 2017-09-14.